Thoracentesis /ˌθɔːrəsɪnˈtiːsɪs/, also known as thoracocentesis (from the Greek θώραξ thōrax "chest, thorax"—GEN thōrakos—and κέντησις kentēsis "pricking, puncture") or pleural tap (from the Greek πλευρά pleura or πλευρόν pleuron "side, rib"), is an invasive procedure to remove fluid or air from the pleural space for diagnostic or therapeutic purposes. A cannula, or hollow needle, is carefully introduced into the thorax, generally after administration of local anesthesia. The procedure was first performed by Morrill Wyman in 1850 and then described by Henry Ingersoll Bowditch in 1852. 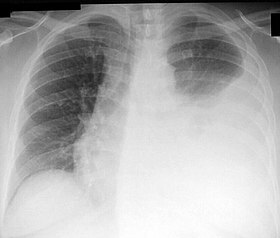 Chest X-ray showing a left-sided pleural effusion (right side of image). This can be treated with thoracentesis. The recommended location varies depending upon the source. Some sources recommend the midaxillary line, in the eighth, ninth, or tenth intercostal space. Whenever possible, the procedure should be performed under ultrasound guidance, which has shown to reduce complications. The illustration shows a person having thoracentesis. The person sits upright and leans on a table. Excess fluid from the pleural space is drained into a bag. Instruments for thoracocentesis and needle biopsy of the pleura. When cardiopulmonary status is compromised (i.e. when the fluid or air has its repercussions on the function of heart and lungs), due to air (significant pneumothorax), fluid (pleural fluid) or blood (hemothorax) outside the lung, then this procedure is usually replaced with tube thoracostomy, the placement of a large tube in the pleural space. An uncooperative patient or a coagulation disorder that cannot be corrected are relative contraindications. Routine measurement of coagulation profiles is generally not indicated, however; when performed by an experienced operator "hemorrhagic complications are infrequent after ultrasound-guided thoracentesis, and attempting to correct an abnormal INR or platelet level before the procedure is unlikely to confer any benefit." Relative contraindications include cases in which the site of insertion has known bullous disease (e.g. emphysema), use of positive end-expiratory pressure (PEEP, see mechanical ventilation) and only one functioning lung (due to diminished reserve). Traditional expert opinion suggests that the aspiration should not exceed 1L to avoid the possible development of pulmonary edema, but this recommendation is uncertain as the volume removed does not correlate well with this complication. Major complications are pneumothorax (3-30%), hemopneumothorax, hemorrhage, hypotension (low blood pressure due to a vasovagal response) and reexpansion pulmonary edema. Minor complications include a dry tap (no fluid return), subcutaneous hematoma or seroma, anxiety, dyspnea and cough (after removing large volume of fluid). The use of ultrasound for needle guidance can minimize the complication rate. While chest X-ray has traditionally been performed to assess for pneumothorax following the procedure, it may no longer be necessary to do so in asymptomatic, non-ventilated persons given the widespread use of ultrasound to guide this procedure. Several diagnostic tools are available to determine the etiology of pleural fluid. First the fluid is either transudate or exudate. A transudate is defined as pleural fluid to serum total protein ratio of less than 0.5, pleural fluid to serum LDH ratio > 0.6, and absolute pleural fluid LDH > 200 IU or > 2/3 of the normal. An exudate that filters from the circulatory system into lesions or areas of inflammation. Its composition varies but generally includes water and the dissolved solutes of the main circulatory fluid such as blood. In the case of blood: it will contain some or all plasma proteins, white blood cells, platelets and (in the case of local vascular damage) red blood cells. A high amylase level (twice the serum level or the absolute value is greater than 160 Somogy units) in the pleural fluid is indicative of either acute or chronic pancreatitis, pancreatic pseudocyst that has dissected or ruptured into the pleural space, cancer or esophageal rupture. rheumatoid effusion.The levels are characteristically low (<15 mg/dL). Normal pleural fluid pH is approximately 7.60. A pleural fluid pH below 7.30 with normal arterial blood pH has the same differential diagnosis as low pleural fluid glucose. Chylothorax (fluid from lymph vessels leaking into the pleural cavity) may be identified by determining triglyceride and cholesterol levels, which are relatively high in lymph. A triglyceride level over 110 mg/dl and the presence of chylomicrons indicate a chylous effusion. The appearance is generally milky but can be serous. The main cause for chylothorax is rupture of the thoracic duct, most frequently as a result of trauma or malignancy (such as lymphoma). The number of white blood cells can give an indication of infection. The specific subtypes can also give clues as to the type on infection. The amount of red blood cells are an obvious sign of bleeding. If the effusion is caused by infection, microbiological culture may yield the infectious organism responsible for the infection, sometimes before other cultures (e.g. blood cultures and sputum cultures) become positive. A Gram stain may give a rough indication of the causative organism. A Ziehl-Neelsen stain may identify tuberculosis or other mycobacterial diseases. Cytology is an important tool in identifying effusions due to malignancy. The most common causes for pleural fluid are lung cancer, metastasis from elsewhere and pleural mesothelioma. The latter often presents with an effusion. Normal cytology results do not reliably rule out malignancy, but make the diagnosis more unlikely. Kelly, Howard A.; Burrage, Walter L., eds. (1920). "Wyman, Morrill" . American Medical Biographies . Baltimore: The Norman, Remington Company. ^ "Human Gross Anatomy". Archived from the original on 2008-02-14. Retrieved 2007-10-22. ^ a b Gordon, Craig E.; Feller-Kopman, David; Balk, Ethan M.; Smetana, Gerald W. (2010-02-22). "Pneumothorax following thoracentesis: a systematic review and meta-analysis". Archives of Internal Medicine. 170 (4): 332–339. doi:10.1001/archinternmed.2009.548. ISSN 1538-3679. PMID 20177035. ^ a b Feller-Kopman, David (2007-07-01). "Therapeutic thoracentesis: the role of ultrasound and pleural manometry". Current Opinion in Pulmonary Medicine. 13 (4): 312–318. doi:10.1097/MCP.0b013e3281214492. ISSN 1070-5287. PMID 17534178. ^ a b c Daniels, Craig E.; Ryu, Jay H. (2011-07-01). "Improving the safety of thoracentesis". Current Opinion in Pulmonary Medicine. 17 (4): 232–236. doi:10.1097/MCP.0b013e328345160b. ISSN 1531-6971. PMID 21346571. ^ de Menezes Lyra R (1997). "A modified outer cannula can help thoracentesis after pleural biopsy". Chest. 112 (1): 296. doi:10.1378/chest.112.1.296. PMID 9228404. ^ "Thoracentesis (section)". Merck Manual. Merck Manual. Retrieved 7 November 2014. ^ Hibbert, Rebecca M.; Atwell, Thomas D.; Lekah, Alexander; Patel, Maitray D.; Carter, Rickey E.; McDonald, Jennifer S.; Rabatin, Jeffrey T. (2013-08-01). "SAfety of ultrasound-guided thoracentesis in patients with abnormal preprocedural coagulation parameters". Chest. 144 (2): 456–463. doi:10.1378/chest.12-2374. ISSN 0012-3692. PMID 23493971. ^ Petersen, W. G.; Zimmerman, R. (2000-04-01). "Limited utility of chest radiograph after thoracentesis". Chest. 117 (4): 1038–1042. doi:10.1378/chest.117.4.1038. ISSN 0012-3692. PMID 10767236. A photo gallery of thoracentesis showing the procedure step-by-step. V. Dimov, B. Altaqi, Clinical Notes, 2005. A free PDA version.